The first photograph of a Leopard 2 PL demonstrator, a modernization for the Leopard 2 main battle tank (MBT) co-developed by the German company Rheinmetall and a number of Polish industry partners has been released. Rheinmetall was announced as favourite bidder for the Leopard 2 upgade in late 2015. The contract value was announced to be 2.3 billion Polish Złoty (or about €542 million). The photograph does show the prototype/demonstrator sitting on a field at sunset or sunrise. Unfortunately it doesn' actually provide much new information that couldn't be extracted from available sources or earlier renderings. The only real new information is that the tank is equipped with a new digital camouflage rather than the classic three color scheme. One day later further photographs of the current Polish armor developments were released for the upcoming MSPO exhibition. Ballistic protection is increased by the addition of applique armor modules from the German company IBD Deisenroth. These thick modules cover the turret front and most of the turret sides; they make use of IBD's advanced modular armor protection (AMAP) family of products. Supposedly Rheinmetall told Polish news sources, that the up-armored turret offers higher protection than the Leopard 2A5's turret. It is unkown if a Leopard 2A4 with AMAP module is able to match the protection level of the Leopard 2A7, which according to Jane's IHS features the latest generation of passive armor. The AMAP armor modules will be produced by the Rosomak company under licence. Furthermore the tank is fitted with new shock-proof seats and a more modern fire suppression system. Due to weight concerns the Leopard 2A4's hull armor remains completely unaltered. About 75% of the four tons of added weight for the Leopard 2 PL upgrade went into the turret armor, but due to the 60 weight limit set by the Polish Army, no further armor could be added to the hull. The hull armor of the Polish Leopard 2A4's is thus not improved in any way and outdated. 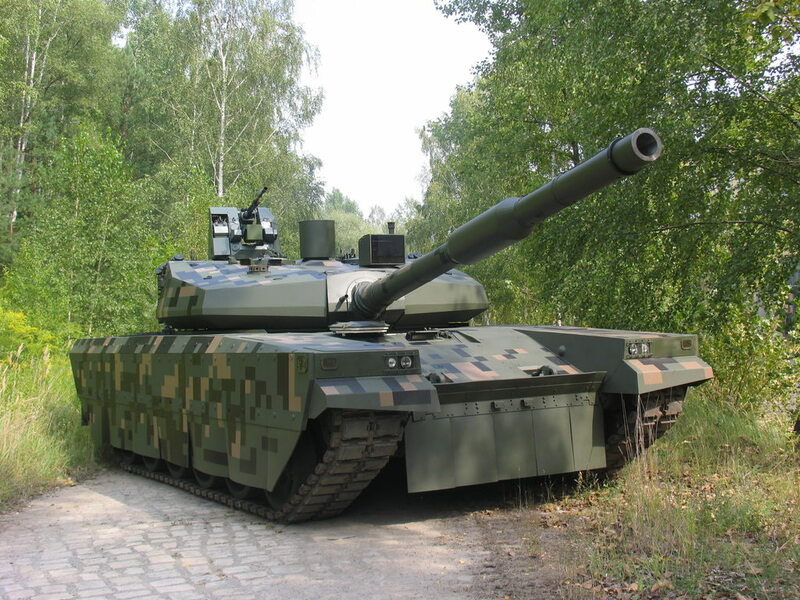 In fact the Polish Leopard 2A4 tanks use hulls made in the early 1980s, as the late 1980s Leopard 2A4 hulls with improved armor protection (starting with the 97th tank of the 6th production batch) were recycled for the Leopard 2A5 and Leopard 2A6; this way less upgrades for the German Army's Leopard 2A5/2A6 hulls were needed. So the Leopard 2 PL seems to have extremely outdated hull armor that shouldn't offer enough resistance to withstand current APFSDS and anti-tank ammunitions. The turret also features the distinctive gap in the turret front section for the EMES-15 sight unit. While this is not a weakspot on the original production tanks (as the armor behind the EMES-15 has about the same minimum thickness as the rest of the turret's frontal arc), the lack of additional armor located in front of the EMES-15 means that only the old 1980s armor remains in this location to protect the tank. 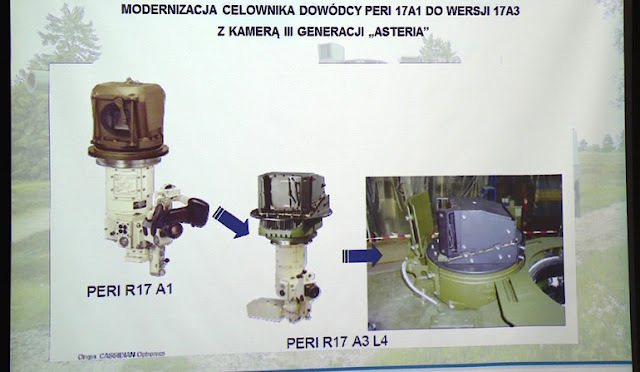 The old PERI R17A1 commander's sight will be upgraded to a version of the PERI R17A3 (the R17A3 L4), which uses Polish-made KLW-1 Asteria thermal imagers. The KLW-1 is made by PCO S.A. and fitted with a third generation detector unit. It has a screening resolution of 640 x 512 pixels and operates at 7.7 to 9,3 µm wavelength. The old second-generation Ophelios-P thermal imager of the Leopard 2A5 and 2A6 tanks has a slightly larger effective resolution of 784 x 576 pixels thanks to a 2 to 1 interlacing and operates within a range of 7.5 to 10.5 μm. It is currently not known if the KLW-1 Asteria also offers an interlacing mode. The KLW-1 Asteria is also used to replace the old WBG-X first generation device of the EMES-15 sight assembly. The upgrade to the PERI R17A3 configuration will be done by Airbus DS Optronics. The R17A3 also includes a laser rangefinder. The tank commander's station will be equipped with a number of digital screens, which allow him to access different informations of the tank's status aswell as the thermal channels of the PERI R17A3 and the EMES-15 sights. The driver's station will be given access to a new KDN-1 Nyks sight from PCO S.A. for driving during night operations. Due to the fact that the old EMES-15 retains it's original position, the PERI sight is also not moved to a higher position, as done on the Leopard 2A5 tank and follow-up models. 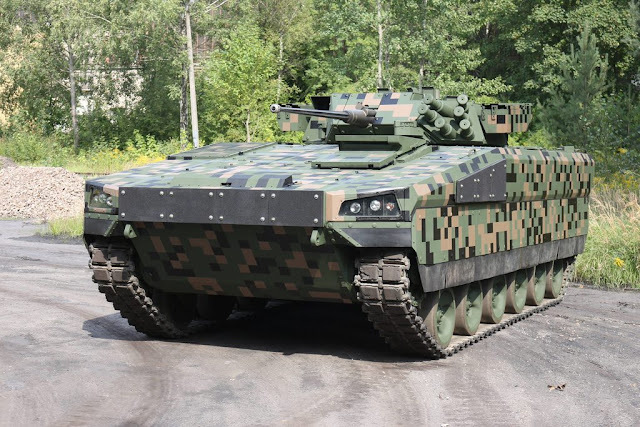 The tank will be fitted with the EWNA (elektrischen Waffennachführanlage) electric drives from Jenoptik, components of which will be locally manufactured by ZM Tarnów. The EWNA drives greatly improve post-penetration survivability, as they do not contain flammable hydraulics, while at the same time improving accuracy and due to the smaller size freeing up further space inside the tank. The 120 mm L44 smoothbore gun is being modified by Rheinmetall to be compatible with newer ammunition such as the higher power DM53 and DM63 APFSDS ammunition and the programmable DM11 HE air-burst ammunition. In particular the changes affect the breech block, the recoil mechanism and gun brakes aswell as the muzzle of the gun. Without the modifications, the gun wouldn't be capable of firing the current generation of German high-pressure ammunition or programmable rounds. The DM11 HE-ABM munition requires a interface at the breech block to set the fuze and detonation mode accordingly. The upgraded tank will be fitted with a new auxillary power unit; like the one used on the Leopard 2A7, the new APU will provide a rather high output of up to 17 kW. For reference: the non-primary power source (NPS) APU of the M1A2 MBT provides only 11 kW (10 kW effective for electrical power). The Leopard 2 PL tank has not been fitted with improved communication systems or a battlefield management system (BMS). It will however feature new towing cables and a slightly different storage box layout at the rear of the turret. Thanks to some of my Polish-speaking readers aswell as forum posts from reliable sources, there is also some more information on the upgraded Anders IFV and the PT-16 tank. The Anders is fitted with the Hitfist-30P turret from Oto-Melara, because there apparently have been numerous issues with this turret on the Rosomak (localized version of the Patria AMV) infantry fighting vehicle (IFV). While the Italian company Oto-Melara was responsible for adding a Spike-LR anti-tank guided missile (ATGM) launcher to it's turret, it was not possible to stay within the weight limit required for amphibious operations of the lighter Rosomak variants. HSW has started to develop an unmanned turret for the Rosomak IFV in form of ZSSW-30, which should be light enough to retain the amphibious capabilities. This turret has the same turret ring diameter as the Hitfist-30P turret and is being pitched as replacement for it. Supposedly the plan from OBRUM is to offer with the Anders a cheaper alternative to the running Borsuk IFV development. When the Rosomaks will be fitted with unmanned ZSSW-30 turrets, the leftover Hitfist turrets would be recycled for use on the Anders. A further problem of the Hitfist turret in comparison to the ZSSW-30 turret is the location of the gunner's main sight. It is located just above the engine cooling vents, which release hot air and fumes that negatively affects performance. When firing Spike ATGMs, the different wavelengths of the Hitfist's thermal imager and the Spike missile caused issues, which only could be fixed by replacing the thermal imagers with different models. As claimed in the first video footage on the PT-16, the PT-16 is utilizing a PT-91 hull fitted with 60 mm thick tiles of applique composite armor (presumably ceramic armor) on the upper hull front (UFP) and hull sides. Given the slope of the glacis, this leads to an increase in effective armor thickness of about 160 mm on the hull front. The new turret armor modules are claimed to increase effective protection to an equivalent of about 1,000 mm steel, albeit it is not stated wether this is for protection against kinetic energy or only against shaped charges. The sensor unit previously identified on the PT-16 facotry photographs belongs to the SSP-1 OBRA-3 laser warning system, which is made by PCO S.A.. This system is capable of automatically trigger the smoke grenade dischargers, when being triggered by a laser source. It can be used to identify the direction of the laser source. The newer photographs of the PT-16 also show the vehicle fitted with a new three tone digital camouflage pattern and new optics. The commander is provided with an independent, fully traverseable sight for hunter-killer operations. The gunner also has a new main optic located on the turret roof. The exact types and specifications of the sights are unkown, but it is possible that the PT-16 uses the GOD-1 Iris independent commander's sight and the GOC-1 Nike stabilized sight system for the gunner. At least the commander's optics appear to be very similar to the GOD-1 Iris fitted to the ZSSW-30 turret. According to Polish sources, the industry is offering two different options for the PT-16: upgrading existing turrets to the new configuration, which includes the adaption of applique armor modules and a new welded roof section; or buying completely new welded turrets, which then would have either a higher level of protection or a lower weight. The composite armor for the PT-16 is supposedly delivered by IBD Deisenroth, while the gun and autoloader are most likely made by Ukranian companies, which already have developed a 120 mm smoothbore gun and autoloader for the T-72-120 upgrade. Ukranian companies are also offering electric turret and weapon drives for the T-72 tank, which have generated interest in Poland. These might be fitted to the PT-16 main battle tank. Rumors say that the industry is trying to push the Polish Army into purchasing the PT-16 upgrade for their remaining PT-91 and T-72 tanks. While Poland currently operates eleven tank battalions, only four of them are equipped with the modern Leopard 2 tank (about half of which have the 2A5 model, while the other half will be equipped with the Leopard 2 PL). This leaves four battalions with the PT-91 and three with the T-72M1. These tanks need to be replaced or upgraded, as they are outdated and provide relatively low combat value. By upgrading all T-72/PT-91 tanks to the PT-16 configuration, the logistics will be reduced (specifically Poland won't need to have two different calibres of tank gun ammunition; 120 mm unitary and 125 mm two-piece ammo). Malaysia is told to have shown interest in the PT-16 tank upgrade, but the PT-16 is running against the current Turkish Altay MBT. I would like to thank my readers for their valuable input, specifically Thotem, Jakub Strózik and qudduscrap for providing good comments on the PT-16, containing details previously unknown to non-Polish speakers. Which is true because my.... 'friend' manage to meet Hishammuddin(the malaysian defense minister) yesterday that he say that Hishammuddin has also interest the Polish new upgrade PT-16 tank but he say that he(Hisham) have to meet PM for relocation about budget 2017 for ATM. 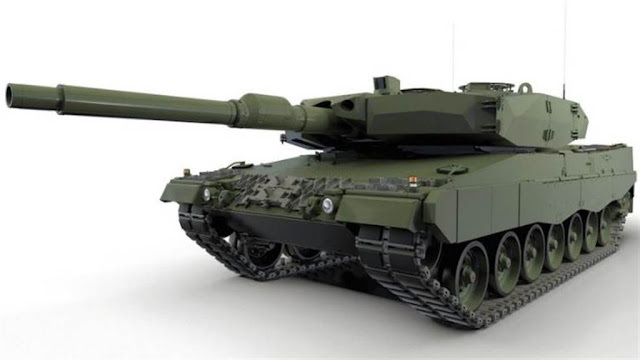 However, he('friend') say that the malaysian private company Etika Strategies Sdn Bhd(Deftech owner which already joint with Turkey BMC and German Rheinmetall AG) will not happy over these Polish new upgrade tank because it is challenging for which is better. Here's a somewhat off-topic commentary, when I watch your blog in my android phone I can't see any search function, would that be possible to add? The MSPO2016 expo exlusive brought some new photos and some new details. There is a digital version, at http://www.altair.com.pl/magazines/htmlissue?issue_id=827&ref=issue#page/5, but only in polish. Since most key points were already given, I will only concentrate on new things. 1. Ammo is to be completely externalized. The locally designed, fully automated 'tape' autoloader holds 22 rounds. These are sent, at a max rate of 12 per minute, into the weapon compartment, through a round, lockable window. 2. The base variant assumes a new, welded turret, as the design intends to keep the vehicle mass at 47 tonnes despite all the added armor and systems. Using the existing turret as a base is still an option. 3. While 2 of the 3 proposed powerplants are nearly certainly the V46-TK and its 1200HP variant, likely chosen for their compatibility and low cost of integration, there is an intriguing 'option 2'. That engine is supposed to be rated at 1088HP which happens to correspond to the ...Germany's Puma engine. 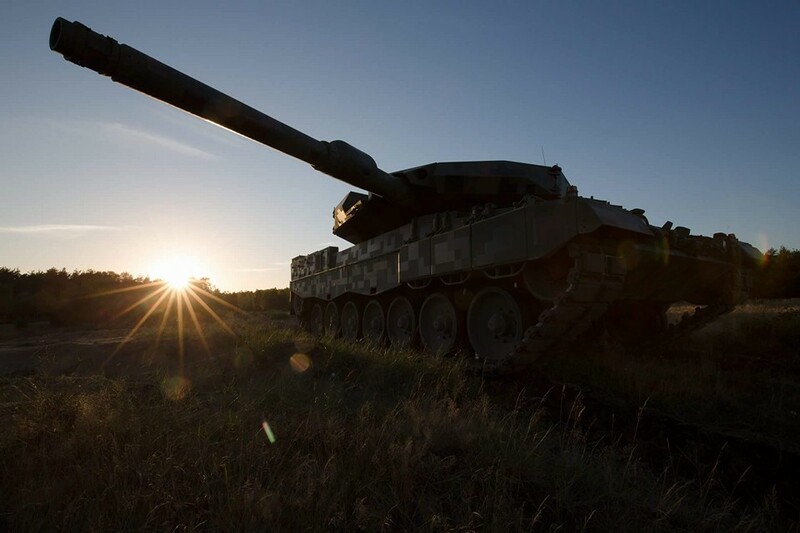 Quite tale-telling, if you consider that MTU has been selected as the preferred provider of powerplant solutions for all applications by the Polish Army. 4. Gun options were identified as 'TG MSB 120' or 'KBM2'. The latter is ukrainian-designed, but I can't pin down the primary selection. The newly-released data on Anders confirmed the currently presented version has also been uparmored using IBD Deisenroth-provided modules. On the Leo2 front, the expo gossip quite heavily featured the word "schürzen". Apparently, the prevailing thinking in the Polish Army is that should it come to worst, the hulls can be relatively easily and quickly uparmored - but turrets can't (at least not without geopardizing the weapon system parameters, such as traverse speed and targeting precision). That is why when forced to choose, the hulls were neglected and the entire uparmoring budget went into the complete turret solution. I've also seen a display confirming the vehicles will feature the CAN-BUS integrating all digital equipment, but this will not yet feature any BMS or digital radios. These are subject to a separate procurement procedure and will likely be installed at a later date. Re point 1,this sounds very similar to the data for the Ukrainian autoloader, right? It depends on the exact version of the Leopard 2 tank. 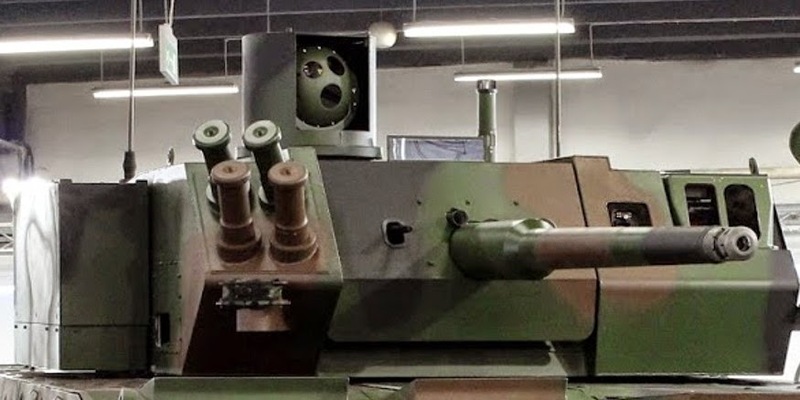 Some users like Greece have installed a laser warning system on the tank. Rheinmetall also offers laser warners as part of their upgrade solution. The basic Leopard 2 has no laser warning system. Germany has tested different active protection systems in the last two decades, some of which have laser warners. The Leopard 2 has been tested with the MUSS soft kill APS and the ROSY system from Rheinmetall, but they have not been purchased yet. "It is unkown if a Leopard 2A4 with AMAP module is able to match the protection level of the Leopard 2A7, which according to Jane's IHS features the latest generation of passive armor. " Do you mean German army A7 or A7+ demonstrator? If German A7 than its armor was not touched and is exactly same as A5. "The turret also features the distinctive gap in the turret front section for the EMES-15 sight unit. While this is not a weakspot on the original production tanks (as the armor behind the EMES-15 has about the same minimum thickness as the rest of the turret's frontal arc), the lack of additional armor located in front of the EMES-15 means that only the old 1980s armor remains in this location to protect the tank." That is not true, the part of armor beyond EMES 15 will be changed and improved, don't know if it can offer same protection level but it will be one and only part of the original armor that will be changed. You should do more research or contact someone before posting statements like this. "The KLW-1 is made by PCO S.A. and fitted with a third generation detector unit. It has a screening resolution of 640 x 512 pixels and operates at 7.7 to 9,3 µm wavelength." That is not true. 640 x 512 is the true sensor resolution (it is array sensor), the imaging resolution after processing is something around 1024 x 768 (it depends on the screening device and in reality doesn't really matter that much). For Ophelios-P 784 x 576 is the imaging resolution, and the sensor have half of the lines in both axes - what made it state of the art in mid 90s. KLW-1 is modern camera with decent parameters (you can get better one) but is built on current technologies. You have compared apples to oranges. Some elements of the tank were not touch on purpose. Radios were not changed because it can be easy upgrade later. Currently Polish Army is comparing solutions of complete BMS systems that will include radios, intercoms and on board computers and will be widely installed on Leopard 2, Rosomak and other perspective vehicles. At this point Army likes “scaled down” version of “Jaśmin” used on operational level, but MoD want something from state owned companies. Same goes for laser warning system, you should know that polish army have Obra system that was used on PT-91, BRDM-2 and all kinds of Rosomak, why not to put it on upgraded Leopard 2? Maybe because they are eyeing some more advanced, “active” solution? 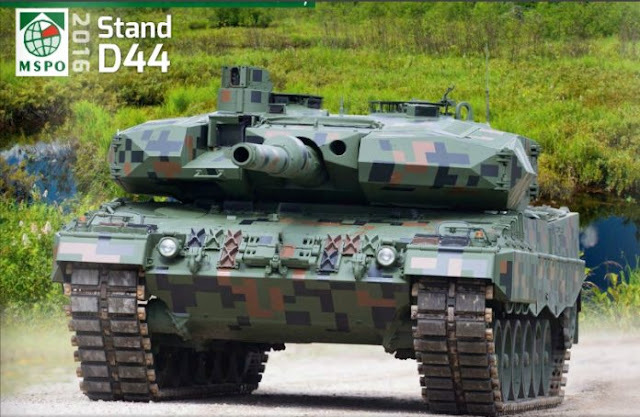 - According to Jane's IHS press release, the German Army version of the Leopard 2A7 is fitted with a new generation of (passive) armor. The armor can be replaced on all Leopard 2 tanks by cutting the steel structure and replacing the inserts. - I wrote about the different in sensor resolution and image resolution, the key word is interlacing. The official specifications sheet from PCO S.A. doesn't mention that the KLW-1 Asteria is using any type of interlacing, hence I wrote "It is currently not known if the KLW-1 Asteria also offers an interlacing mode. ".